So I am going to try a bottle cap mural this year (hopefully this fall if I can get enough caps collected). Have any of you done this project for an outdoor piece? I am going to have my students work on a 7 ft tall...3ft wide(on all 4 sides) box. This will go around the pole that holds our school reader board sign up (a sign & pole I feel is super boring/unattractive). I was thinking about using caulking﻿?!? Any other thoughts??? I want it to survive the winter...into the spring. Any tips/experiences shared would be welcomed! You are my hero when it comes to kids and art but your spelling sends me into fits of giggles! The word is, "Caulking", not cocking...........I cannot stop laughing! I did this with my summer art camp kids - finished piece 8x12 (3 panels)we used glue on foam insulation board - it would never hold up outdoors. Screws get expensive - how about a tile glue? I had people collect caps but did even better when I visited the recycling center - many people don't remove the lids on their recycables - kinda stinky but I collected 100 in 20 minutes. Good luck with the project - the kids loved doing it & the final piece! I haven't done a bottlecap mural yet, but also hope to do one this year! Pre-drill holes in all the caps. Have the students glue them down in place. Then come back and screw each one in. They will not go anywhere after that. When I did mine, we did it on foamcore and hot glue. However, that would not work outside. You could screw them in, or I have seen some teachers use liquid nails. Where are you coming up with the design? I've save crayola caps for 12 years and have bags full. I want a pixelated picture to make a mural. Where can I find one? Mea Culpa, Mea Culpa! I'm sorry I didn't see the post about spelling haters!You keep writing and I'll keep reading without my red pen! Ha! I have seen sooo many people use bottle caps for a mural... i think it is awesome! I cant wait to see how yours turns out. Good Luck! I think the CAULKING would work. I make junk creations and use caulking and it holds really well. I even use it with small metal pieces. You can squirt it out and let the students dip craft sticks in to apply it to the caps or use one of the caulking guns. You'd probably have to use the gun as it might be too hard for the students. I've got lots of caps saved, but so far haven't attempted it. There's a book written on the how tos if you wanted to invest. As for your spelling...keep up the good work! See now I could see doing this on a wall on my screened in porch in the distant future....it is just the seed of an idea right now! I've done three cap mural projects with my students, but they have all been indoor works. If you are planning on doing something outdoor, I would highly recommend using screws to attach the caps to the plywood. Speaking of plywood, I would prime both sides and paint with outdoor house paint. It should hold up fine. Good luck! Go for it! I agree with Zach, make sure you prime and paint with exterior latex. I would recommend using screws rather than adhesive. Here is a link to a "pin" from my Pinterest board:(http://pinterest.com/pin/68814022/). These are the screws that I used for our bottlecap murals. Super easy to use and kid-friendly if you have students screw them in. I see this was posted ages ago...I'm doing research on screws/adhesives for our mural but the link no longer works. Can you give me the details? Loved rading everyone's ideas!!! Mr. E love love love your site - can't wait to get mine up and running - to share all of these wonderful ideas we have racking our brains. I (and my student's parents) have been gathering bottle caps, and crayola marker lids for a mural - I think we have enough to start our mural soon. I hope everyone will share their creations!!! I've seen several bottle cap murals that have turned out amazing!!!! We made large plywood cutouts of bugs and flowers at an art camp at the Racine Art Museum. After I primed them with white latex paint, the kids painted them using acrylic paint on both sides since they were free standing. 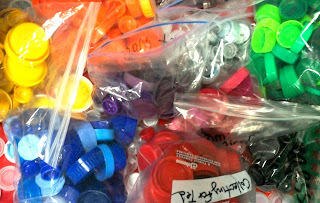 The plastic caps and lids were all predrilled. The kids attached them using silicone caulk. Adult staff put in all of the screws (3500 for 19 pieces!). They were placed around the grounds at both of our museum sites, and looked fantastic. The pieces were auctioned off at the end of summer. My hubby is a builder and he said to use an outdoor construction adhesive such as "Loctite." He said that should last a good long while!